The Lapdogs were dancing wagging for joy when they found out they were hand-picked to try the limited edition Love Potion #9 from Merrick Pet Care! 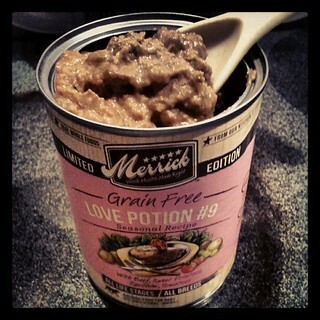 No longer just a fun song, Love Potion #9 is an all new, grain-free recipe designed for all life stages and breeds. Made with real, wholesome beef, sweet potatoes, zucchini and tomatoes, the Lapdogs say it's just as tasty as the name would imply! The only drawback? Love Potion #9 is part of Merrick's seasonal canned food collection, which means it's - sadly - only available for a limited time. Although the Lapdogs received two cans to enjoy, they've made it clear that Mama had better go find some more at the store before it flies off the shelves. Lola suggests you waste no time and grab a can or two of Love Potion #9 for the puppy love of your life today! She promises you will receive lots of tail wags and sloppy kisses! Disclosure: Merrick Pet Care sent two cans of Love Potion #9 to Lapdog Creations, free of charge for review purposes. I was not compensated for this review and all opinions expressed are my own. Because the can is pink, Lola and Sophie probably think they don't have to share with their brothers! Love the name and it sounds like something most dogs would enjoy. Right now my crowd is eating chicken and rice thanks to Sebastian. He has an ulcer and has to have a special diet so all the others are getting some, too. How did Zeus do at the vet? Did you do blood?